- By Rob MacNeil - Any cycling fan who followed our great sport from the mid 80's to the late 90's knows the name of Steve Bauer. As an amateur Steve raced in Canada and the US dominating every race he entered. As a pro, his list of palmares from Europe are even more impressive, first North American to win a Classic (1989 Championship of Zurich),14 days in the Maillot Jaune, and and countless tales to keep you up well past your bedtime. Prior to the 1984 Olympics, a very common site was that of Steve and Davis Phinney sprinting for the line ahead of seasoned pro's like Laurent Fignon, Stephen Roche and others. Steve couldn't have become a pro on a higher note than with the Silver Medal at the Olympics and with his first race as a pro, a Bronze medal. The race was the 1984 Professional Road Race World Championships, won by Claude Criquelion. Steve was asked to join what would become one of the most influential and powerful teams of all time, La Vie Claire. The team would be captained by 4 time Tour de France winner Bernard Hinault and 2 time World Champion Greg LeMond. Steve was a force to be feared in the Classics as he was always in the front of the peleton. The Classics were not the only thing Steve excelled at, with the White jersey on his back at the 1985 Tour de France for most of the race. Steve finished the Tour that year in 10th place, not bad for a sprinter. 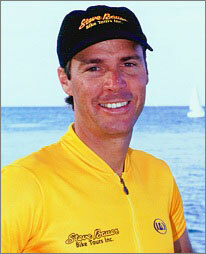 The Tour was a good race for Steve as he wore the Maillot Jaune (The Yellow jersey) for a total of 14 days. Take a look who has spent more days in the Maillot Jaune and you see names like Merckx, Hinault, Indurain, LeMond, Armstrong, Fignon. Look at riders who have worn the Maillot Jaune for less than 13 days and you see some of the most famous names in cycling like Phil Anderson, Marco Pantani, Lucien Van Impe, Francesco Moser and so many more. I could go on for hours about one of my personal idols. Some of the highlights of Steve's career include the first North American to win a Classic (1989 Championship of Zurich), two Tour stage wins and many days leading the Tour de France and the Coors Classic. Disappointments include the crash with Claude Criquelion and the centimetre loss at Paris Roubaix. Steve Bauer is in the news again as part of a team to bring the World Championships to Hamilton, Ontario, Canada. Speculation has already begun on who can win with this course. I have ridden it and it will be hard. The winner will need to be a climber as well as strong alone in a break. Personally I feel Lance Armstrong could win here as well as Jan Ullrich. Time will tell. I was lucky enough to sit down with Steve for a few questions. did either rider try to sway you to help them directly? Steve: It was a tough go. I remember, how devasted and angry Greg was to hear Bernard say after Alpe d'Huez that he was racing until the end of the Time Trial to decide the Tour. 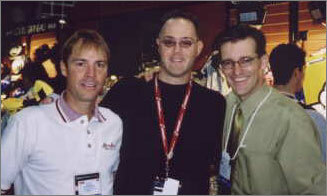 I helped them both at times and eventually worked for Greg after the Alpe d'Huez stage. 86 was Greg's year and he was the best. You have to admire Hinault for his tenacity and his drive to push Lemond to his maximum capabilities. Since 86... there has never been two men capable of winning the Tour on the same team. Unique and very rare. 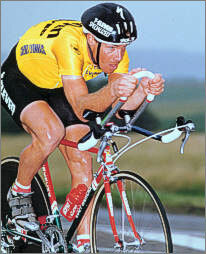 Rob: Hypothetical question: Tour de France, who would win in a race against each: Greg LeMond or Lance Armstrong? and character (mentally) to win the Tour. That is why there are so few guys that win. There is often a rider that wins several times and rarely once, The best of "le tour" is reserved for these elite few. If you have what it takes to win the Tour, it is a given that hardly anyone else in the peloton does. That is my perspective.. The only way to answer this one would be if they really did race in the same era. Otherwise, why compare?? Rob: Do you ever talk to your old La Vie Claire Teammates: Bernard Hinault, Greg LeMond and Andy Hampsten? Steve: I speak to them all. It depends where any when. I have seen and gone for a bike ride with Andy Hampsten... I see Bernard at "Le Tour' in the Village Depart. I spoke with Greg on the phone just last week by coincidence. Rob: You rode with Lance Armstrong, do you think he can win 6 tours? Steve: Physically and Mentally he has everything to win 6. There is no sense in thinking about number 6 until he has won this year. Cycling is a tough sport with a lot of unknown factors which could influence his run. I am cheering for him to win 5 first. Lance would tell you the same thing. Rob: Of all the bikes you ever used in your career (Excluding yours) what was your favourite? Rob: Your greatest moment in cycling? Steve: Winning the First Stage of the Tour de France (solo) and putting on the Yellow Jersey for the first time. Rob: Your worst moment in cycling? Steve: Flat tire on the top of the Climb, Last Lap, Worlds 89 Chambery.... I was at my best... Greg would have had a hard time beating me in the sprint!!!! Rob: Did you ever get the Silver Medal from the worlds that was stripped, and that was owed to you? Rob: In your years of racing, who did you respect the most, fear the most and who was the classiest rider? Steve: Hinault had a lot of class, Sean Kelly also, I didn't "fear" anyone... You may as well stay home if you do! I respect all the people in the business who helped get the job done with integrity. This means team directors..Paul Kochli, Jim Ochowicz and Tom Schuler... I couldn't have asked for better guys to race for. My teamates for all the years... My mechanics,soigneurs ...They all played an important role.. This is what I remember the most. Rob:I have been forced to ask you this by the whole staff at PezCycling News, can we all stay on your couch when the worlds are on? Steve: I won't be home....ha ha.. You have to come see the race live....www.worlds.stevebauer.com Your official tour operator!!! started your pro career with a bronze medal, then the crash with Claude Criquelion. Did you think of any of these events when trying to get the World's for Canada? Steve: It was not my intiative to get the Worlds. The Worlds played a good role totally. Whatever, you experience in life you have to use for the positive. I have absolutely no negative experiences from my carreer and I have great memories. The World championships in 88 and 89 were two of the best races I rode in my career. On those days I was as good as anybody in the professional peloton, that's a positive in my book. Rob: Now that The World's are in Hamilton, what will your roll be? Steve: Steve Bauer Bike Tours Inc. is the Official Tour Operator. We have placed about 14 nations in hotels that work for cycling teams. We are selling accommodations and packages which include tickets on www.worlds.stevebauer.com I am consulting the organization ongoing to help them in any area that they require to make this event a success. Rob: Are you involved in this aspect of the negotiations with the City of Hamilton? Steve: The status of the Worlds is right on track. The politicians of Hamilton (city counsellors) are playing a bad card, protecting their own interests, forwarding a budget for emergency services, police and incremental costs that is way blown out of proportion. The CEO and Chair of the board are working this out with the city and come to realistic terms. The status of the championships is not in question but unfortunately the media have taken the negative ball and rolled it out pretty far. Steve Bauer. Please visit his website www.worlds.stevebauer.com for tour details.